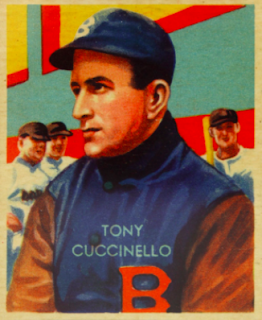 Born November 8, 1907, baseball lifer and the Dodgers first All-Star, Tony Cuccinello. Cuccinello made that seminal appearance at Comiskey Park, which hosted the 1st baseball All-Star game on July 6, 1933. Today's black-and-white set of 18 players profiles that game's NL roster and features future Hall of Famers like Carl Hubbell, who famously struck out "Murderers' Row" the following year (recapped by 1938 Wheaties #5). Unfortunately, limiting this set to one league also omits AL superstars like Babe Ruth, Jimmie Foxx, and Lou Gehrig (set checklist). You win some and you lose some. 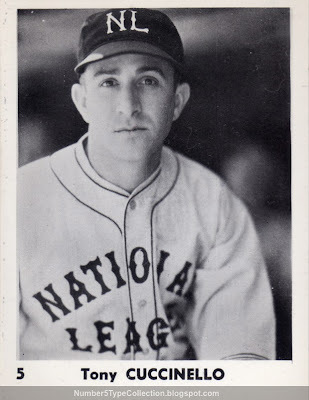 Burke printed thousands of baseball photos over the decades and his stock of 1930s players proved popular enough to use for sets like these. According to the experts at Net54, Bra-Mac sold their sets directly to collectors for a few dollars per series in the mid-1970s and first advertised them via card collector magazines in Feb/Mar 1974, hence the catalog date. Value: Tony cost me $3 on eBay, not bad for a NM single from an obscure mid-70s oddball set. HOFers like Hubbell, Pie Traynor, and Paul Waner should cost a little more. Fakes / Reprints: It'd be a simple set to reprint, but haven't seen or heard of any in the market.